New version with support for T-Mobile G1 Google Phone! New Handy Backup 6.2.3 and Handy Backup Server Network 6.2.3! A new Mobile Devices Backup plug-in has been added to the program. At present, it allows backing up contacts of Google Phone, also known T-Mobile G1. Learn about T-Mobile G1 backup. The internal architecture of Handy Backup has undergone several important changes. Firstly, this concerns files-based backup: under certain circumstances, Handy Backup failed to back up large amounts of files. Now you can safely create backup tasks involving several hundreds of thousands of files. Secondly, some changes have been made to multilanguage versions of the program (particularly, Russian build of Handy Backup). Finally, as always, there are multiple minor updates and bug fixes which made general performance better and more stable. Download very powerful yet easy-to-use backup software for Windows. Free 30-day fully functional trial version! Also, please don’t forget to take part in March 2009 contest! 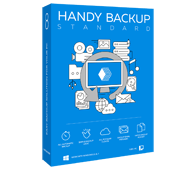 We have already received several great reviews, buy you still have the chance to get Handy Backup Small Server, worth $249, for free! Learn more about how to get free backup software.